Eikon Green Monster Tattoo Machine Eikon Green Monster Tattoo Machines are based on the project machine that was featured in the first five issues of Machinegun Magazine. The frame is a straightforward welded construction, steel side plate design, with a precision machined, two-piece, quick-change tube vise. All Green Monster Machines are built with 8 wrap Eikon Crown Standard coils and Tru-Spring armature bars and springs. 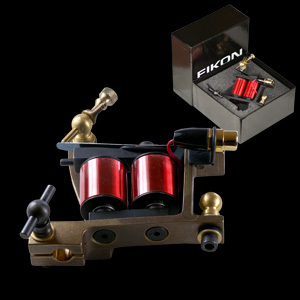 The Liner eikon tattoo machines have a light-weight armature bar and a 15uF capacitor. The air gap on the Short Stroke Liner Machine is 3/64″ (dime), resulting in a speed of approximately 140 Hz with a tube and needle set-up in the machine. 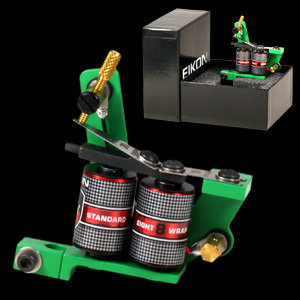 The Green Monster Eikon Tattoo Machines come in four versions. A short stroke liner, a long stroke liner, a shader, and a coloring machine. 1: The Short Stroke Liner Machine has a 0.019″ thick timing spring and a 0.018″ thick main spring. The air gap on the Long Stroke Liner Machine is 1/16″ (nickel) resulting in a speed of approximately 140 Hz with a tube and needle set-up in the machine. 2: The Long Stroke Liner Machine has a 0.020″ thick timing spring and a 0.019″ thick main spring. 3: The Shader Machine has a mid-weight armature bar, a 33uF capacitor, and a 0.016″ thick timing spring with a 0.017″ thick main spring. The air gap on the Shader Machine is 1/16″ (nickel), resulting in a speed of approximately 110 Hz with a tube and needle set up in the machine. 4: The Coloring Machine has a heavy-weight armature bar, a 47uF capacitor, and a 0.015″ thick timing spring with a 0.016″ thick main spring. The air gap on the Coloring Machine is 1/16″ (nickel), resulting in a speed of approximately 100 Hz with a tube and needle set up in the machine. All Green Monster Eikon Tattoo Machines are painted industrial tractor green and weigh 7.7 ounces (without a tube or grip). Machines come complete and ready to use, but some fine tuning or adjustment may be required to get the machine running to each tattoo artist’s preference.. Weight 218gms. Laconia Tattoo Machine Eikon Laconia Tattoo machines coils don’t mount parallel to the spring mount, the base plate they mount to is actually angled downward away from the spring mount. The armature bar is installed with no bend on the back spring, but the bar still clears the back coil on its down swing. Finally, the armature bars trajectory begins almost parallel to the spring mount, then travels down and away to connect with the front coil core. These differences are intentional.. But you still get the Eikon Tattoo Machines unquestionable quality. The subtle geometry modifications on this unit when compared to other Eikon Tattoo Machines allows for the Laconia to be tuned easily with out having to bend the back spring. The cast 1025 steel frame is blackened to protect against corrosion. They feature brass binding posts and uses 1 1/4″ Crown Standard coils. The cast silicone bronze frame is left naked so it will age with time. It features blackened steel binding posts and uses 1″ Crown Standard coils installed on a 1/4″ yoke. The Laconia tattoo machines are tuned to operate on a wide range of voltages in order to accommodate for a variety of skin types, tattooing styles and needle configurations. Coloring machines operate around 105 CPS and 45% duty using a heavy weight conventional armature bar unloaded. Shading machine operate around 130 CPS and 45% duty using a medium weight conventional armature bar unloaded. Note: Speed and Duty Cycle readings stated are approximate and are provided as a guide for selecting the correct machine for the job.